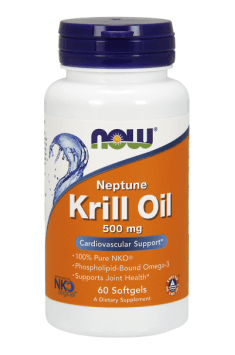 Neptune Krill Oil (NKO®) is known for its unique fatty acid (FA) profile, which includes EPA and DHA, plus phospholipids. In addition, NKO® naturally has Astaxanthin, a powerful free radical scavenger and immune-supporting carotenoid. Clinical studies have shown that NKO® can help to support joint comfort, healthy blood lipid levels already within normal range, and may help to maintain healthy feminine balance. The Phospholipid-bound forms of EPA and DHA from Krill Oil have also demonstrated exceptionally high bioavailability. Take two capsules 1-3 times per day, with a meal. Scientists believe that krill oil is the secret of an extraordinary health. It provides support to the heart, brain and joints. It has a huge advantage over fish oil, because it combines omega-3 and antioxidants. It is devoid of fishy taste, it does not cause heartburn or any other side effects. Even with long-term supplementation with high doses there were no side effects. Suggested dosage is dependent on individual needs, but considering the diet and lifestyle of modern manyour need for omega-3 and protect against free radicals is large. I recommend taking 2 capsules 3 times a day. Its provide essential nutrients and no harmful trans fats. The substances contained in the product are better absorbed in the company of fat, which is why krill oil should be taken with a meal.